Students are full of curiosity about the world. Immersion in our science program takes advantage of their natural curiosity. Classes held inside and outside lead them to observe carefully, question deeply, and construct concepts to build a strong foundation in the physical, life, earth and space sciences. Within an inquiry-based approach, students learn to do science instead of just learning about science. They are presented with many hands-on materials and fascinating ideas to explore. They are taught to communicate their thinking and findings in a variety of ways as they collaborate on projects that are exciting and meaningful to them. Our fifteen acres of woodlands, stream, gardens, and fields provide many opportunities to observe scientific principles, to discover patterns and cycles, to chart growth and change, and to determine cause and effect. Science concepts are integrated into other areas of study as children explore themes in social studies, language arts, and math classes, among others. 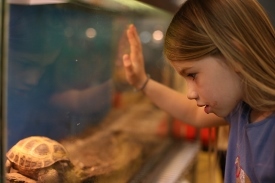 Field trips away from school in each grade connect with science and excite students to question further. Fourth graders solidify their understanding of human impact on the environment with an overnight outdoor experience toward the end of the school year. These outdoor environmental excursions continue in Middle School. Plan and carry out investigations and controlled experiments. Gather and record data using appropriate tools and techniques. Think logically about evidence and skeptically about results. Employ imagination and intuition as part of the scientific process. Communicate and defend scientific reasoning. Learn through failure and through trial and error, as real scientists do. Science is well integrated with technology as well as other areas of the curriculum to facilitate meaningful connections between disciplines. Projects that incorporate technology, engineering, and mathematics can also be found throughout the Lower School science curriculum.